of the most glorious looking tulips in rainbow sherbet type colours. for some reason i am truly drawn your piece from last year. you continue to delight me with your wonderfully funny posts. Both paintings are really wonderful, poor bullied tulips. Here we get around this quick dying problem by using the camera the instant they're in the vase!! We know they die the second they figure out they're living with McLeans. lol. Both paintings are beautiful. The colors are so lovely. Both paintings make me want to get out my paints and create something. Thank you for the inspiration. Oh you have blown me away yet again Tracey!!!! these tulips are so gorgeous and they really pop!!! and your poppies are magical and I think I have actually tried those tam tams.....yummy!!!!! Wishing you a wonderful Sunday!!! 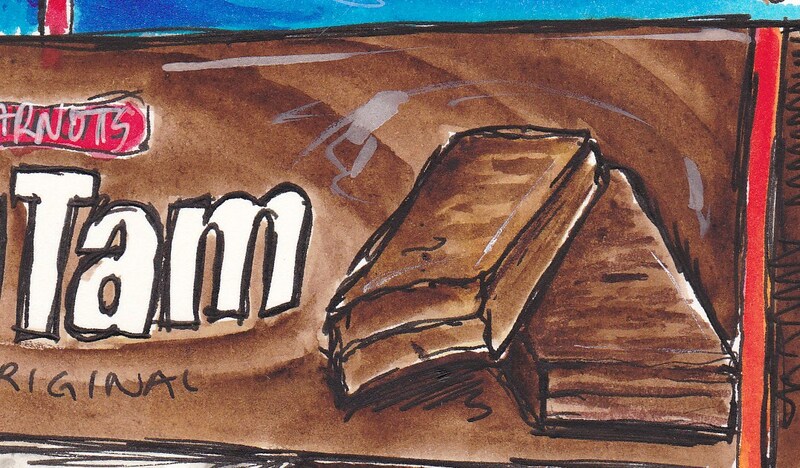 Tracey,your an awesome writer and artist and I love how you always share the story of what you are drawing. I also love the bullied tulips and the thought that they choose to show beauty if only for a few days. :) The poppies are magnificent! I love all of the veins and personality. Your two paintings are so beautiful. Love to see all the details in them. Love your post, you made me smile! I like that!! Have an amazing day! Okay Trace so you've passed the guilts to me now...I too may have bullied tulips but you see I never even asked! I just bought the suckers! What does that say about me??? Ahh... POOR tulips!!! At least now, thanks to you they have the life they deserve! They are now not just poor, bullied Tulips, but world FAMOUS ones! Tracey, your beautiful tulips and poppies have lifted my heart today and cheered me. And your blog is so inventive to read, I love it. Thank you for giving me another little step to recovery. oh these are just juicy beautiful colored tulips! AWESOME! your art makes me happy! Those poor tulips. No wonder they didn't last long - so tired. Your Poppies are outstanding. Beautiful all around. Ha ha you got me laughing again. Guess what I am doing...walking around in my bikini trying to get someone to do something for me...but no luck...I am getting back into my jogging pants very soon because I am now frozen! The last work on this page is just to die for! Oh my..such gorgeous blooms..magnificent flowers...you have me dazzled again..they are totally sublime! Love the soft pinks...gorgeous and radiant! 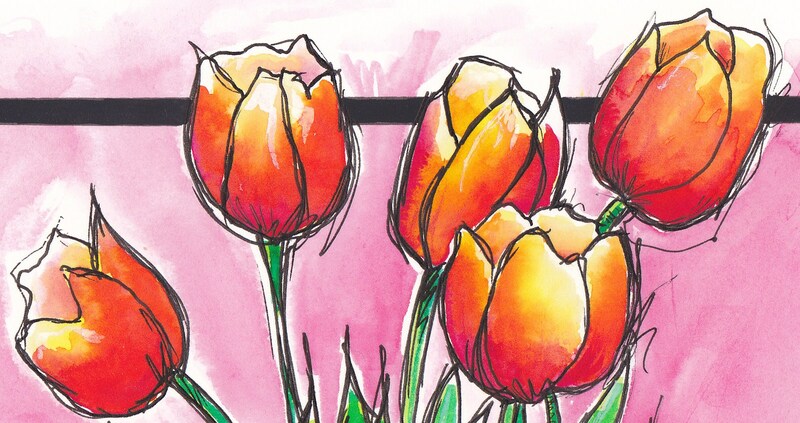 Love all your sketches, but now I'm worried about all those poor bullied tulips! Tracey you are so humorous! I love the comedy in your posts! These tulips are beautiful! 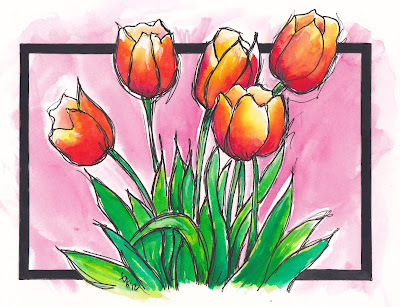 your tulips are so gorgeous, well done, Tracey! Your colors KNOCK ME OUT!!! Are these acrylics? So bold. So striking. And the poppies lighter, but detailed fantastically well. I keep forgetting our seasons are opposite. It's so warm here!! I bought Peonies, as it is too warm where I am to grow them and they are lasting a long time. Maybe they are a little hardier than tulips? Los tulipanes son muy bonitos, los colores llenos de vida son fantásticos y que decirte de las amapolas, tan frágiles y tan bien pintadas. Poor tulips.... I bet they were glad to come home with you and have a few days free from bullying before they well..... you know...... were no more. See you next week for mint choc chip! What lovely paintings - I love your different styles - both are very beautiful in such different ways. Lol! Poor tulips. :) I think they were grown in a hotbed or whatever it's called in English. :) Great paintings! I love the poppies, too. In Minnesota, garden nurseries have "hot houses" which are delightful for both people and plants in the middle of the winter when temperatures plummet well below zero. I often think how shocking it must be for a plant or cut flowers to go outside in the dead of winter...kind of like the bullied tulips you so beautifully drew. I like the difference in style of the flowers - the tulips with the brilliant color as the focus and the other flowers with the detail. Both are lovely! 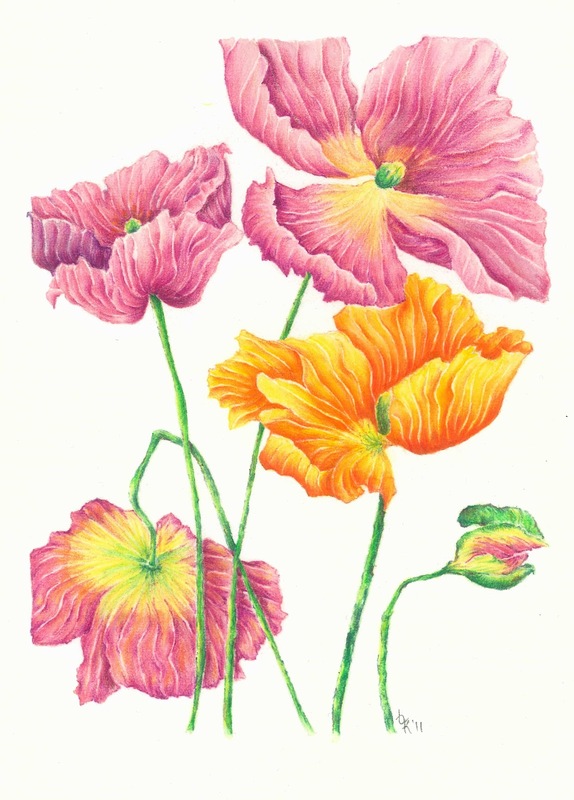 Love your tulips and the poppies too! They radiate so much of positive energy ...simply beautiful! Too funny! My keyboard is just not safe from coffee sputter when I read your posts! I'll never think of forced flowers the same way again! 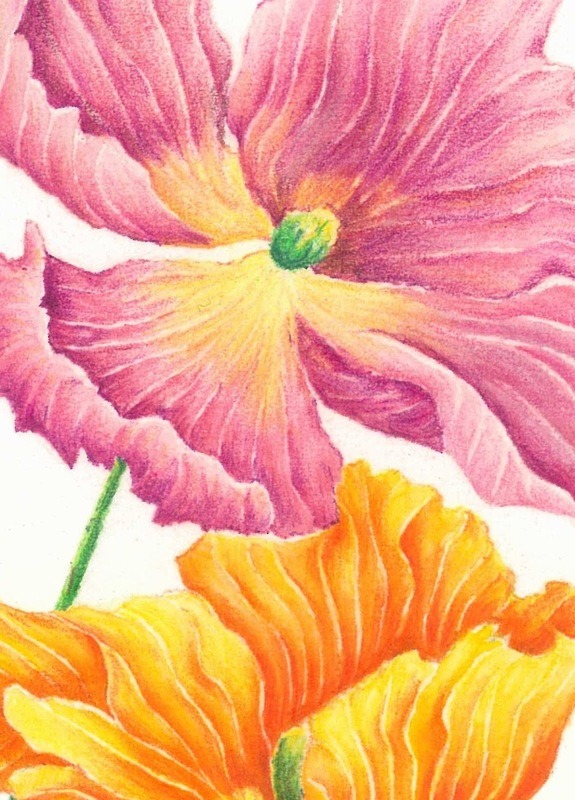 I LOVE both styles you shared here with the side view of the tulips and the interior of the poppies- no matter what style you go wit, your work is always so very beautiful! They are all just beautiful, and your blog is wonderful! I really love your botanical drawings!! I love the old fashioned books you can get where instead of photos you get drawings and thats what this reminded me of!!! 54 cooments already... My u r popular. I am of course writing this from Corfu where it is summer and hot - did I mention that? No need to for e bloom from flowers. Just have to force lazy woman from sunbed into pool! Tulips my gave flower so I love them all even if bullied. Beautiful! You do lovely work! Thanks for sharing! Ha! Knew I was going to love your blog as soon as I saw your banner at the top! Definitely bookmarking this one! p.s. I LOVE this post... SO much... I literally LOL'ed! They're both wonderful---I Love your style!!!! Poor tulips :( But at least they live forever now - and as always I'm sat reading this smiling even when it's about battered tulips! these flowers are to die for!!! lovely Tracey!!! Tracey...so beautiful! I feel special just having a look. 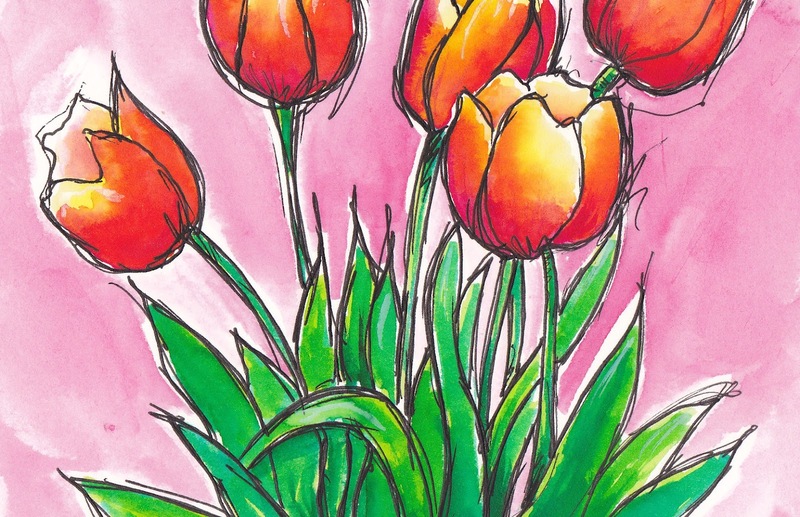 You always have so many beautiful works to show, I love your tulips! 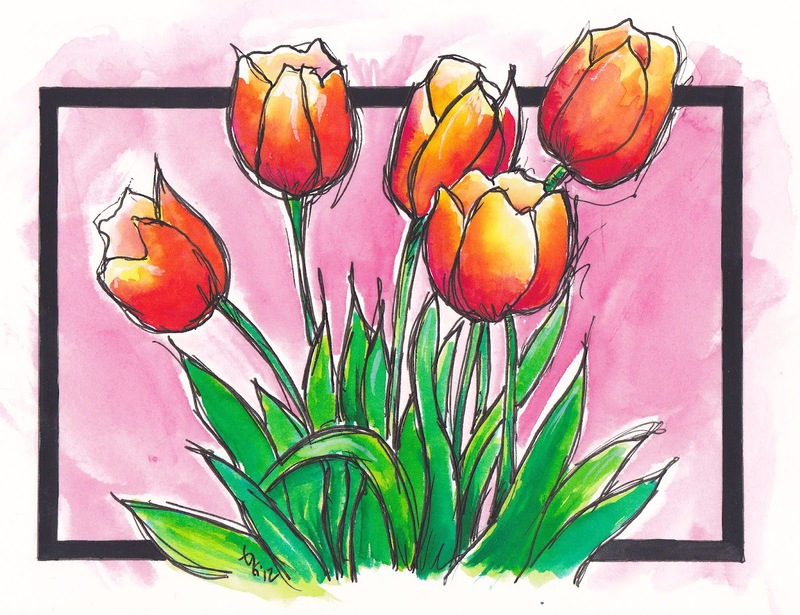 Your artwork is gorgeous Tracey... and I love this post and your beautiful rainbow sherbert tulips and poppies... looking forward to your week 2 now!! I love your flower drawings, they area lovely. I love they way that you used the colors. Your post made me giggle all the way through. 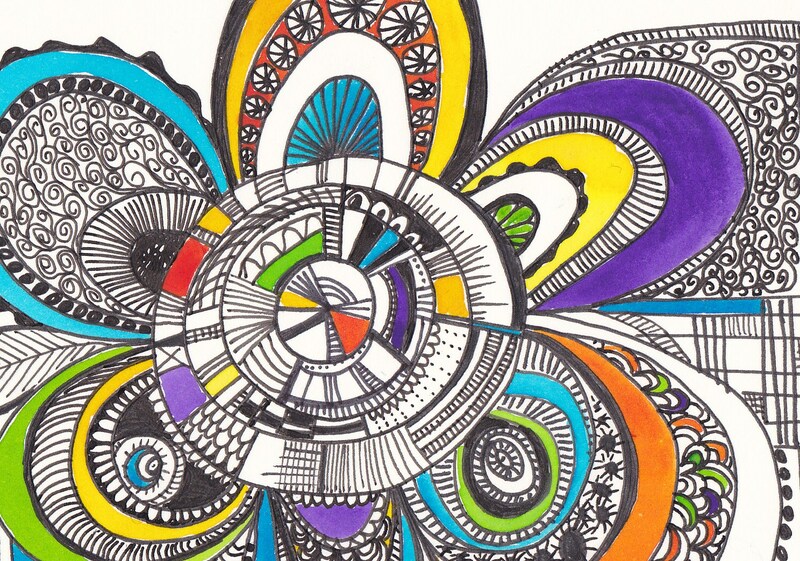 Wow amazing and gorgeous colours and artwork! 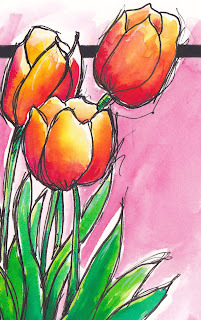 Oh that tulip sketchy painting is beautiful, I like the poppies as well but I think the tulips are just breath taking.